hello there today I should have been in Leeds attending a Regional training run by the Company, a few members of my team are attending and I am so sad to have missed spending some time with them. I am sure they are all having a blast and I did say that the training will be a lot quieter for all attending. Before I left I have sent all those a little gift. Aren't they fabby? I just love them and I am wearing one every day I have made myself different colour ones to match my outfits LOL I have seen these bracelets at convention in Nov. one of my fellow demonstrators had them as an organized swap. I love jewellery and I love SU bright buttons so it was an obvious choice for the girlies, I just hope my lovely Pasionettes loved them as well. 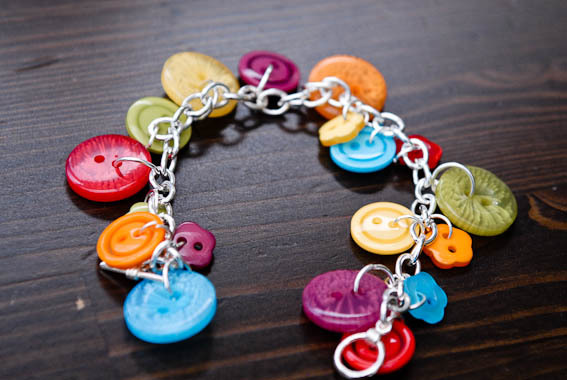 They were made using the Brights buttons collection. I hope you like them too I will have some kits ready to purchase on my blog next week, keep your eyes open for them. This is beautiful. I was lucky to receive on at the convention too from my friend Kirsteen and love wearing it. Wow monica that's beautiful what a great idea, again!! Hi Monica, this is gorgeous, what a great idea & fab gift. These are gorgeous! You are one super talented lady! Sending Daisy hugs your way - they always perk me up! Oh my word! I have never seen these before! Gorgeous and fun and fabulous! I am not into jewelry too much and still am drawn to this! Must be the bright SU colors! Thanks for sharing for all of us non-convention goers!